Crystal Oldman, second from left, with QNI colleagues Sharon Aldridge-Bent, Joanne Moorby, Christine Widdowson, Matthew Bradby and Joanna Sagnella. Earlier this month, 350 nurses from all over the UK travelled to Buckingham Palace in London for an evening reception hosted by His Royal Highness The Prince of Wales. The reception, on March 14, recognised the skills and dedication of nurses to improving the health and well-being, and the profession's contribution throughout the 70 years of the NHS. Held in the spectacular ballroom of Buckingham Palace, the atmosphere was truly celebratory. From students to those who have been nursing for decades, the whole spectrum of our profession was represented. The collective experience in the room probably added up to several thousand years of nursing. Prince Charles was charming and engaged, spending almost two hours speaking to nurses. He asked about their experiences, their views on the NHS, the current challenges and opportunities for the profession and the most rewarding parts of their role. By the end of the evening he would have had a clear picture of the pressures nurses are under in many parts of the NHS, as well as nurses’ dedication to delivering excellent care to patients, families, carers and communities. We were also honoured with the presence of the Countess of Wessex, who asked about the changes over the years to nurse training and education. She would have been left in no doubt about the importance of a degree-level education for nurses, and how this contributes to the holistic care of patients with highly complex conditions, the maintenance and improvement of patient safety and positive patient outcomes. I was honoured to be presented to the prince before he entered the room, along with RCN president Cecilia Akrisie Anim and the chief nursing officers (CNO) for England, Wales and Northern Ireland – Jane Cummings, Jean White and Charlotte McArdle – and a representative for the CNO’s office in Scotland, Karen Wilson. It was a fabulous opportunity to thank His Royal Highness for hosting the event, and for his support of the work of the Queen’s Nursing Institute. Founded with support from Queen Victoria at the end of the 19th century, the QNI is the oldest nursing charity in the UK and more than 50 members of the QNI family were among the guests at the reception. When I told Prince Charles that more than 90% of all clinical contacts occur in the community and primary care, he appeared shocked and asked if I was sure this statistic was correct! The drinks and canapés appeared to go on forever and the prince stayed longer than expected, more than 30 minutes beyond the official end of the reception, which perhaps indicates how much he enjoyed the evening. His short speech was inspiring, and he thanked all those present for their work, expertise and commitment to patient care. Attending the reception and witnessing Prince Charles’s genuine support of the nursing profession was a real highlight of my nursing career. He recognises how registered nurses provide vital expertise at some of the most challenging times in people’s lives, and it was an honour to be among hundreds of other nurses working in diverse settings with people and communities across the whole life course. 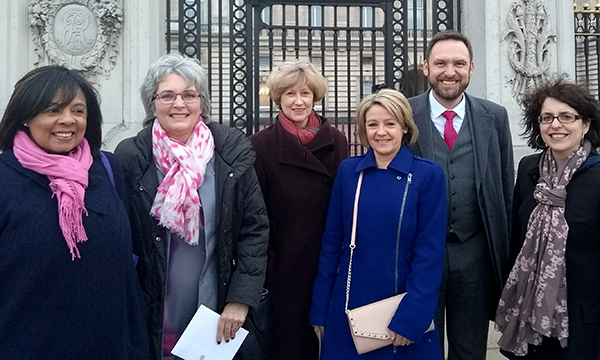 From care pre-conception to post-bereavement, the nurses gathered at Buckingham Palace represented all those with a common purpose and a strong alignment with the values of the QNI and a commitment to delivering excellent nursing care.